I'm going to have around $50k to spend on a replacement for my 13 year old CTSW. I'm having a little trouble deciding on another CT as opposed to a Globe Swift given the new Basic Med. 1) Maintenance and Gas bill deltas are significant. 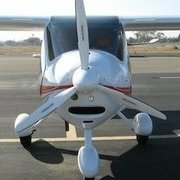 2) You have the photo platform program down in the CT... will a low wing plane change your photo program significantly. You will find another CT, hang in there. Is that Swift hangared at Mammoth (KMMH)? I've got a few hours in the Swift, they are a bit sluggish with the 145hp but awesome with the 200-210 options! They are pretty friendly on the ground but I've only flown them in fairly benign conditions. 200-210 for a Mammoth Guy. Maybe 180hp. My buddy who owned a Swift called it "The fastest looking slow airplane available". Max Cruise on the/some 210hp version is 175mph. My friend at my field has a red Swift. I think a CT will perform better on a hot day at your elevation. It will cost less to maintain and it doesn't have 50-60 year old parts. I would get a 210hp version, so no. Thanks for all the feedback. The Swift that would work for me is probably beyond my budget.